In November, we took a 2 week trip to Costa Rica--my first time in such a setting. (Cuba doesn't really count.) For half the holiday, we stayed in what seemed like one of the last true hidden gems of the west coast; a truly local village. The latter half was spent in the much more developed and touristy Tamarindo, farther north. After a 4 hour drive in a little Jeep on roads I was completely unfamiliar with, we arrived! Surfing, hiking, hammocking, eating, relaxing, and visiting Jaco, Crocodile River, and the Manuel Antonio National Park were on the agenda. Honestly, now I understand why so many expats relocate here. It's so beautiful, friendly, and they seem to really be ahead of the curve on many environmental issues. The path to the beach in Osterillos Oeste, a little undiscovered piece of surfer's paradise. But don't expect any traveller conveniences. It's very much a tiny village with one shop, two restaurants, and a taco stand. There's no hot water in most lodgings and air conditioning only if you pay a pretty penny. Crocodile River. All the crocs were hanging out underneath the bridge but the view down river is just as amazing to see. Tamarindo is rife with touristy things to do, like horseback riding on the beach as these people are doing. This guy is out almost every morning leading a new pack of people slowly down the beach. One day we decided to take a drive to some nearby villages, just to see what was up. A nice amount of rain and a lot of fruit, that's what. 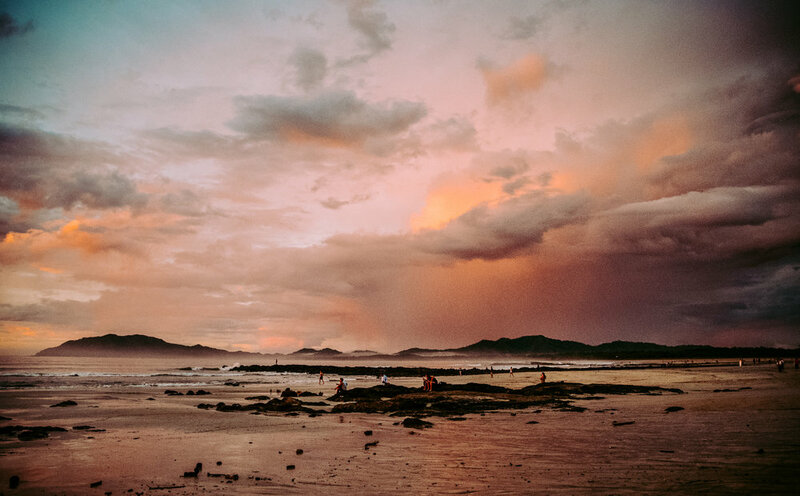 Sunsets in Tamarindo were some of the best I've seen. With the sea mist and colours, it almost appeared to be another planet. One of the local surf instructors took the morning off to shred some waves of his own in Tamarindo. 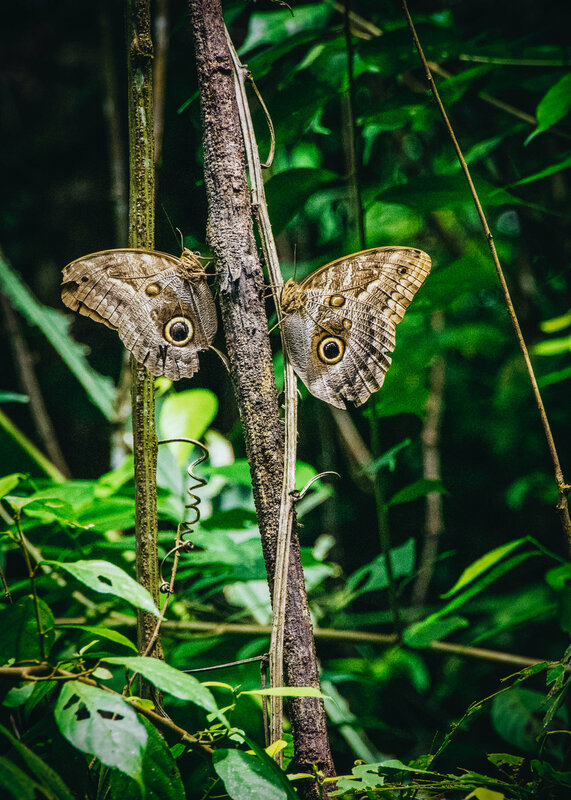 Two Owl Butterflies (Caligo memnon) rest in the jungles of Manuel Antonio National Park. We had come to see sloths... Without a lot of luck, that's a difficult thing to do with only an hour to spare and no guide. 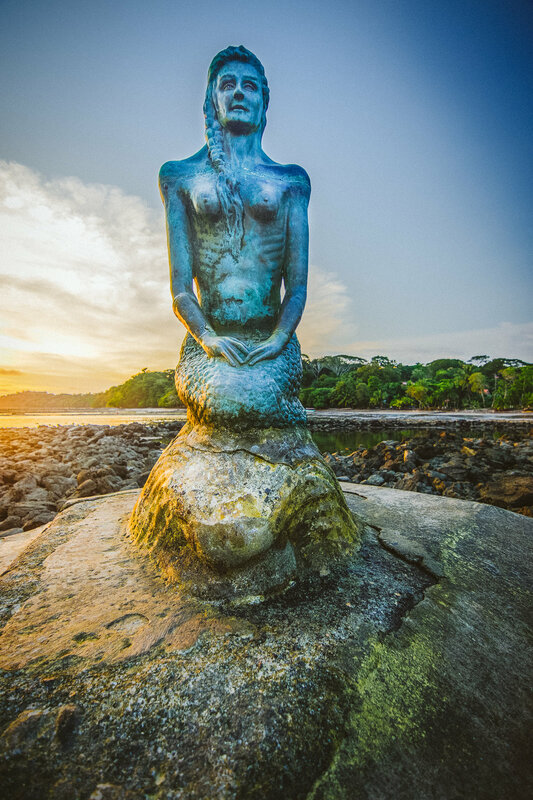 La Sirena is this sculpture of a mermaid far out into the ocean. At high tide, she is completely surrounded by the ocean but at low tide, you can easily walk there. 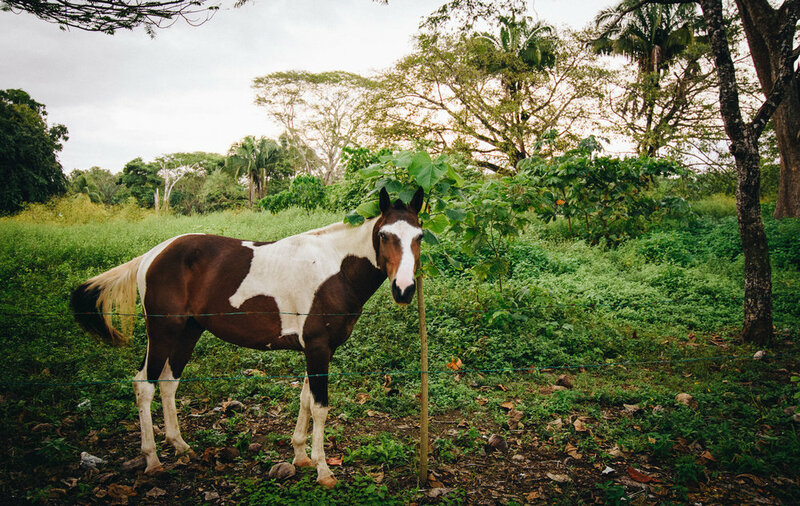 A friendly neighbourhood horse at Esterillos Oeste. She liked to hang around the children's playground. 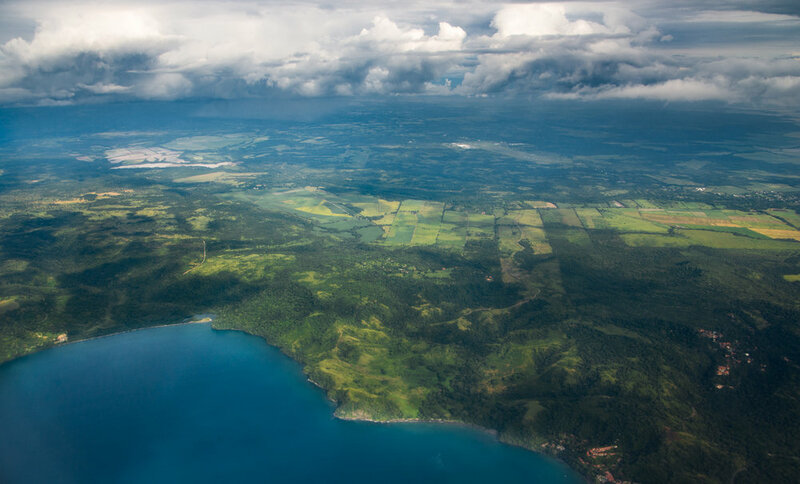 The blues and greens of the flight home from Costa Rica. Look at all those trees! A plantation south of Parrita, right after yet another rainstorm! 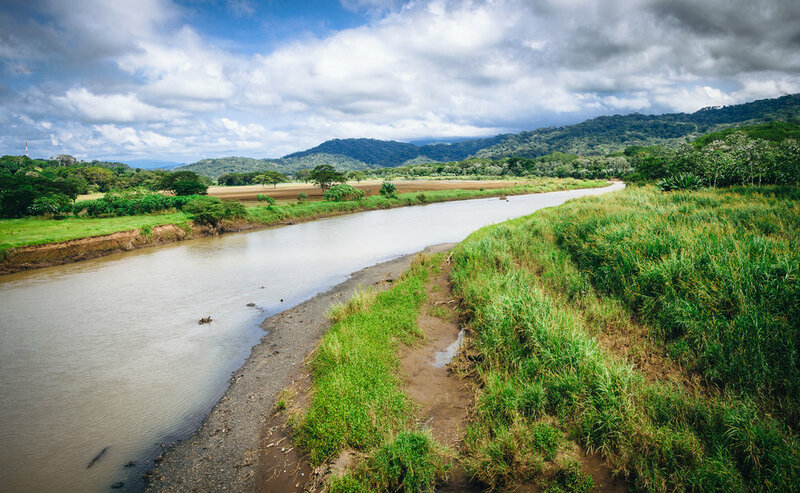 The rural landscape of Guanacaste is so lush but arid as well. How interesting. Almost everyday we had massive downpours. This was one of the roads to our cabana, after the rain. We hid out and ate at a local spot that's not even listed on the maps. Sunset in Tamarindo as the surfer boys come in for happy hour. Pretty bird, pretty bird. This little guy hung around with me as I scrambled out to the reef to take surf shots. Here's that otherwordliness again, slightly later. The sunset cult is out in numbers, as well as the guitar player who lulls the sun to sleep for the night.